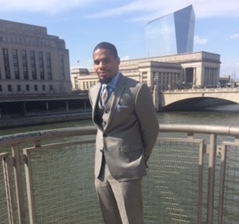 Ahmad Hylick is earning his degree in Business Administration through the Haub Degree Completion program (HDC) after graduating from the Community College of Philadelphia. A union carpenter in Philadelphia, Ahmad believes SJU has challenged him and he is grateful for all of the professors who have helped him excel. Looking to the future, Ahmad says he has been able to gain an abundance of knowledge about what it takes to start and successfully run his own business, thanks to SJU. Follow @sjuartssciences & @haubschool on Twitter to learn about a new member of the class of #SJU16 each weekday.